We are Stowells Funeral Directors in Basingstoke and we are here to provide support and compassion during this difficult time. By helping you to arrange the funeral of your loved one, we will ease the burden upon you and your family, ensuring they receive a dignified farewell. Situated on the Worting Road (at the junction with Downsland Road), our funeral directors has served the town of Basingstoke for more than 40 years. In this time we have provided funeral services for families in localities such as Oakridge, Chineham and Kempshott, as well as further afield, including Oakley and Cliddesden. Your wishes are what matter to us and we will tailor your loved one’s funeral to your own preferences. Whether this is a spiritual ceremony, a non-religious send off, a traditional or a contemporary celebration of their life, we will ensure your goodbye is an affecting and positive tribute. It is not unusual to experience uncertainty following the loss of a loved one and not knowing how to begin arranging a funeral is perfectly natural. That is why we will be there to offer guidance and advice whenever you need it, making sure you are not left to feel as though you are making the decisions alone. 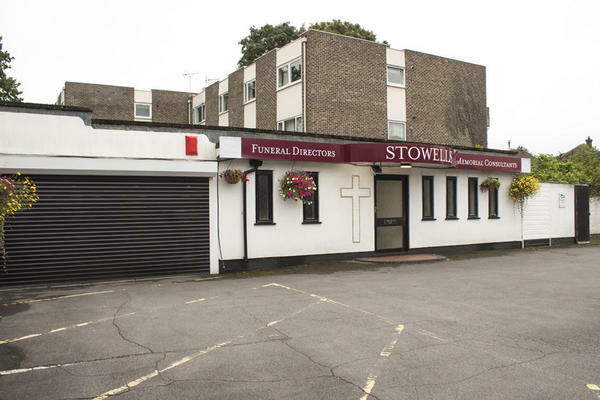 At Stowells Funeral Directors in Basingstoke, we are available to talk 24 hours a day. We are here for you when you are ready. Call us today on 01256 321281 to talk through your personal requirements. At Stowells Funeral Directors, we understand how special life is with those that you love. For us, every funeral is unique and personal. We have a service to fulfil every wish, with every detail carried out with the same uncompromising quality of care. From a traditional service, to a colourful woodland burial, your options are limitless with our Full Service Funeral. If you have a little more flexibility when it comes to arrangements, then we can provide a Simple Funeral for a lower cost. There is parking available on our forecourt. Our staff are available 24 hours a day on 01256 321281 if you require our services outside of these hours. They were very professional and caring made you feel comfortable in a very hard time. The help and service I received was lovely and genuine. The staff were lovely and very caring. I am very happy with the service provided and would certainly recommend stowells to other clients. Your service form start to finish was above all expetations. The team took time to explain all the the procedures and understood our feelings at the time. We received a very friendly, considerate and supportive assistance from the funeral directors. We thank you for providing such a respectful and professional service during the difficult time.